Malaga is a province that offers a great variety of open air activities, which are either free or very cheap to enjoy. Apart from the many beaches all over Costa del Sol the natural surroundings of the town, bounded by mountains, offers people who like trekking, rock climbing, mountain biking, etc. perfect conditions. Malaga also has a lot of nice parks and gardens where people can relax in the open air. To mention a few there are Gardens of Pedro Luis Alonso located behind the town hall, La Consuela a park from the 19th century in the area of Churriana and El Retiro with its subtropical species, a botanic and an ornithological park. For people interested in doing a nice bargain there are two major street/ flee markets in Malaga. On Wednesdays there is the street market in the area Huilin open from 9.00-14.00. There you can buy everything from clothes and shoes, to fruit and electronics. 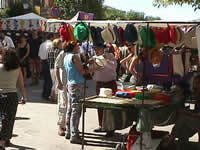 On Sundays from 9 .00 -14.00 there is a market next to the Stadium La Rosaleda. This market is mainly for clothes and none consumable products. Get advice, ask and discuss topics with your fellow travelers at Malaga.